Allegro Dance is a boutique style dance studio aimed at bringing premier dance training to Oakland County. Established in 2016, Allegro Dance offers private coaching and classes in Tap, Jazz, Ballet, Pointe, Hip-Hop, Creative Movement, and Mommy & Me. We offer both recreational and pre-professional divisions of classes. We have enjoyed watching our dance family grow from 75 students in May 2018 to 266 students as of January 2019! We look forward to watching our dancers progress from year to year! Director and instructor at Allegro Dance, Jenn Montie has been teaching dance since 2003. She credits most of her training to teachers Patricia Squire Lorenz and Leif Lorenz. 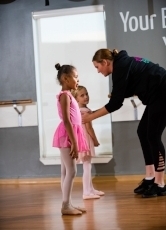 For the last eight years, she has been assistant director for a local youth ballet company and decided it was time to start something of her own! She has performed in and has set numerous Ballets including "The Nutcracker", "Swan Lake", "Coppelia", "Grad Ballet", and "Les Sylphides". Since 2008, Jenn has been fully certified in STOTT Pilates Levels 1 & 2. During the day, you can find her training clients at Equilibrium Pilates Studio. Her knowledge of Pilates enables her to train dancers in a safe and effective manner. In 2015, she became certified as an American Ballet Theatre instructor. Jenn loves to pass her passion of dance onto young dancers. Along with emphasizing proper technique, her goal is to develop artistry and confidence within each dancer. From her years of teaching, she has formatted each class to be physically and psychologically appropriate for that specific age group and level. This allows each child the best opportunity to grow, learn and develop their dance technique safely and without feeling overwhelmed. Jenn sees it as her job to ensure that every student that dances with Allegro Dance, whether a recreational dancer or a serious dancer that may want a career in dance, receives premier dance training so that they have the ability to do whatever they choose with their knowledge of dance! Emma Seidel, a West Bloomfield native, began her dance training at local studios. In high school, she began training under Samm Shelton, Michael Lemanski, and Jodie Randolph whom she credits much of her pre-professional training. Before entering college, she was named The Sean Anderson Performing Arts Scholar from rapper Big Sean. Emma spent her summers training under renowned artists and companies. She was awarded a full scholarship to Complexions Summers Intensive for two consecutive summers, Brighton Dance Festival, Art Lab J, and New Dance Fest. After high school, Emma decided to pursue her degree in Dance at Point Park University in Pittsburgh. She is currently a student at Wayne State University studying Public Relations with a minor in dance. Emma can be seen in music video "Incessant Love" by singer Ashley Garza, “atleastthatshowIrememberit..." a dance on film by Sean Hoskins, a Dance Moms Commercial and a P.S.A. for CW50 featuring Upstander. She has a love for the stage and live audiences. She has performed with RobinSon Dance Company, Chelsea Ballet, Michigan Ballet Theatre, Pure Existence Dance, The Conservatory Dance Company, and X2 Dance. Emma is the creator of G.I.R.L.S, a program focused on empowering young girls to create their dreams and have a voice. Emma is excited to join the Allegro family and eager to push your dancer to be the best individual and artist that they can be. Allegro Dance is located at 6405 North Telegraph Road in Building H-4 inside the Bloomfield Medical Village. Our spacious studio is equipped with modern dance floors that aid in shock absorption and help avoid injuries common among dancers. Our lobby is equipped with a large TV that displays the dance class that parents can watch via a closed circuit camera system! We have a small boutique stocked with hand knit dance sweaters and leg warmers, tights and Allegro Dance apparel. Across the walkway from Allegro Dance is Equilibrium Pilates Studio. Equilibrium Pilates Studio has been training clients in Pilates and Gyrotonics since 1997. Private and group sessions are available to you throughout the day so you can stay active while your child takes class at Allegro Dance!